Moss Hill Farm uses premium organic methods following Bio-Dynamic practices putting our major emphasis on creating good healthy soil. We apply the biodynamic processes to our 1-acre, intensively grown market garden. 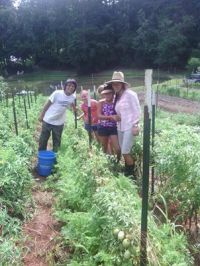 It is in constant production with vegetables, herbs, cover crops, and flowers grown for our CSA members. We do not market at farmers markets, restaurants, or co-ops, but only to our CSA members. Our mission includes growing nutritious healthy fresh wholesome real food; providing hands-on education for all ages; and pursuing the highest level of sustainable soil. We treat our land respectfully and do not add any chemical fertilizers or pesticides. As a living system, we feed our soil with herbal homeopathic preparations, green manure, cover crops, and compost made from local safe natural nutrients to make humus, organically derived. We use many different soil-building techniques that improve the health and bio-diversity of the land, such as crop rotations, bio-dynamic practices, co-creating with nature, and cover crops. We are here to answer questions, educate, and assist. We love getting feedback, so please keep it coming! Treat the farm as your own for you are buying a share in it. Feel free to wander through the fields as you wish and we welcome visits. We’re off to a great start this season and look forward to growing with you, making it the best year yet! We purpose to grow food for individual family shares known as CSAs (Community Supported Agriculture). The shares are limited and are accepted on a first come basis. There is an application at the main page for either a full or half share. There are occasionally extras that we market through INTERNET sales by those not current CSA members. Member pick-ups will be at Moss Hill Farm. Farm distributions are held on Tuesdays(all full), Thursdays, Saturdays after 1:00 on the day You decide when you sign up. You will need to sign up for one of those days with each day limited to 20 shareholders. First to contact me for that day will confirm your time. To get to Moss Hill Farm from Alpharetta: From Highway 9 north of town, turn on Mayfield Rd, continue approximately 2 miles to Freemanville Rd and turn right. Go approximately ½ mile, past road to Milton High School. On the left, you will see 2 mailboxes by an asphalt driveway, turn down and follow the signs. Park on the gravel right pass the pavilion. Distribution will be held at the pavilion. You will need to sign in on the clipboard to show you are scheduled to pick up your share that day. Distribution baskets will be labeled with a listing of the vegetables and quantities in your share for the week. The vegetables in your share will be in bins on tables, clearly labeled and scales will be nearby. Some items will be bunched; some you will weigh for yourself. Finally, picking up your produce is meant to be an exciting, leisurely, and gratifying time. Take a moment to get to know other shareholders, exchange recipes and greet the farmers. As a convenience, Tuesday, Thursday or Saturday pick up can be from the walk in cooler if you have difficulty in making it at the specific times. Foods are harvested the day of the pickup and will usually maintain freshness for a few days, but best time is day of scheduled pickup. You will have a basket with your name on it on the shelves inside the walk in cooler. You have a couple of options if you know that you’ll miss a CSA pick up. If you’ll be out of town, you can have a friend or neighbor pick up your share. Please let us know if someone will be coming in your place, be sure to educate them what to do - remember how you felt the first time you picked up. Or you can change the day of pickup if you let us know by Monday. You will get a Sunday evening email to remind you about the weeks activities. If you miss a farm share, we cannot double your share for a future distribution; or if you’re a half share, we can adjust an occasional switch but it is very hard to do it every pickup. TIP: enter your pick up day and time on your phone calendar to send you a reminder. Remember we are harvesting perishable food that has a short shelf life, once we harvest it, it must be used right then. If you’ll be available to pick up your share after hours on Tuesday, Thursday, or Saturday, please let Floyd (floydkeisler@gmail.com) know on Monday before pick up. We rarely get to check email on pickup day. Texting is by far the safest most sure way, Floyd at 770-815-2815. We will be offering on a limited basis “Pick your own” (PYO) crops of flowers, and herbs. These items will change location frequently for crop rotation, but we’ll give directions to you where they are. You can pick during the hours of distribution, so you may want to come early to allow yourself enough time. Please first check in at the pavilion for what “pick your own” crops are available and how much. Also grab a bag and scissors for harvesting herbs (or flowers). Hot Peppers: grab the fruit and twist upwards while holding the main stem or snip with scissors; be sure and wash your hands after handling hot peppers, often the hot stuff will get on your fingers. Herbs (and flowers): cut stems with scissors and place in a fresh water container if you have one. When you get home trim the ends at an angle for ample water absorption. Most vegetables have many storage techniques that work. We’ve listed several suggestions to help your keep your produce fresh. Beans and Peas: Put in a green plastic bag in the refrigerator. Cucumbers, Eggplant, Peppers, and Summer Squash: Wipe off until dry and store in refrigerator. Herbs: Put in green plastic bag without water in the refrigerator or with the stems in a cup of water on the counter. Leafy Greens & Green Veggies: Put in green plastic bag with paper towel to absorb the moisture (so they don't get slimy) and refrigerate, or wash off first, roll up in clean kitchen towel, and place in a green plastic bag (they last long and are ready to eat). Onions, Potatoes, and Tomatoes: Place in a paper bag on the counter or in a dark, dry place that is not too cold, but don’t store onions and potatoes together. If trying to ripen tomatoes, leave on windowsill. (Don’t wash dirt off of potatoes, they keep longer with soil on them until you are ready to use). Winter Squash: Keep uncovered in a well-ventilated, cool, dark place. Root Crops (beets, carrots, celeriac, radish, turnip): Put in green plastic bag in the refrigerator - don't wash until ready to use. You are welcome to visit the farm on Mondays, Wednesdays or Fridays with an appointment. Please let us know before you stop by so we can expect you. We also invite you to help out on the farm during our regular volunteer hours. To volunteer you will also need to sign a 'Release and Waiver' agreement. We do all sorts of tasks in the fields to learn how we grow and take care of your food. This requires you to be in good physical condition. We always have fun, please join us! Be sure and notify your kids of the electric fence at the farm’s perimeter. We will turn it off during distribution, but make sure that they are aware. We need this to control deer. When walking through the fields, be sure to walk in between the beds of the plants, in the rows. We take care not to compact the soil of the vegetable beds. Most of the walk paths are only 12 inches wide. No dogs or cats please unless you are prepared to pick up after them. And finally, as Georgia residents, I’m sure you know to look out for poison oak and ivy, wasps, and fire ants. Please be aware of these pests and steer your children away from the anthills. Ants and wasps are our friends, but they are very protective of their homes. Each Tuesday you will receive our weekly newsletter. Please let me know if you do not receive emails from me every week. We’re also starting a recipe section in the newsletter. If you have photos of a recipe that you’ve prepared, please send photos and the recipe and we’ll include it on that section. As the newsletter is developed there will be a recipe drop down list for your recipes. Recipes from last year will be included. We also love having guest articles, send in your creative writing, poetry, or farm tales. Thank you so much for your interest and support. Without you we would not be able to help your families eat the most healthy nutritious food that is grown locally premium organically. "I Am the Way, Truth, the Light." "Be then Do then go."